Intake and exhaust mods on a base injected 5.0 Holden V8 achieve a highly cost-effective power gain. Depending on the specific parts used, it's not unusual for these simple bolt-ons to increase output up to 15 percent. But what mods should follow if you don't want to spend big $$$ on a blower or mega engine build? Daniel Cowley of South Australia picked up this ex-police VS V8 complete with a free-flowing exhaust and intake system. The airbox had been replaced by a high-flow pod filter (with no cold air ducting), while the factory exhaust made way for twin 2Â½-inch pipes up front, twin cats and a Y-piece merging into a single 3-inch pipe with a rear resonator. Rather than just go collector-back, the previous owner had also opted for a pair of Advance 4>2>1 headers. Daniel had a couple of choices - he could either install an aftermarket blower kit or warm over the mechanicals of the big 5.0. Financial limitations, however, meant a new blower kit was out of the question and any internal engine mods would be fairly limited. Under the advice of Leon Vincenzi of Awesome Automotive, Daniel settled on a camshaft swap with a computer re-map. In a recent AutoSpeed interview, Leon revealed the standard Holden 5.0 V8 intake manifold has very poor airflow - and this has implications for the cam profile you should select. A too-wild cam will give "the usual" lumpy idle, doughy low-rpm response, reduced low-rpm torque and - due to the intake restriction - won't be able to breath to its potential at high revs. The driveability trade-off will be huge and - at best - all you'll end up with is a limited torque increase at mid-to-high revs. For Daniel's car, Leon specified a Crane H286 hydraulic bump stick (part number 884301). This grind delivers 230 degrees of intake and exhaust duration at 50-thou lift, 292 degrees advertised duration on the intake and exhaust, and 110 degree lobe separation. Open and closing angles on the intake (at 50-thou) are 10 and 40 degrees, while the exhaust is 50 and 0 degrees. Both the intake and exhaust deliver 496-thou gross lift. In short, the Crane H286 represents a good 'middle ground' between the standard cam and the aforementioned wild cam. Leon tells us a new cam can be slid in without touching the rest of the valvetrain, but he highly recommends also adding Crane lifters and pushrods. The anti pump-up lifters and stiffer one-piece pushrods are said to be better suited to the higher rpm characteristics of the new cam. With a bigger cam giving the potential for around 200hp at the wheels, it's recognised that the standard injectors will be running a dangerously high duty cycle. Accordingly, Daniel went and sourced a set of second-hand Bosch 775 blue injectors from a 5.7-litre factory stroker Commodore. These squirters are the same top-feed design as the standard 5-litre units. Altered engine management is essential with a bigger cam and injectors. Leon offers the ability to re-map the factory Holden program to suit. Using Kalmaker software, he can alter all ECU-related operations in real-time - everything from thermo fan switch-on temperature to rev limit, fuel and ignition. You name it. The first step is to strip away various engine components. Off comes the air intake pipe and filter, engine trim covers, intake manifold, rocker covers and half of the valvetrain (everything between the cam and the rockers). In order that the factory camshaft can be slid out, the coolant radiator, fan, air conditioning compressor, lower pulley and water pump must next be removed. The original timing chain set is also taken off, and - in this case - Leon noticed it was reasonably stretched. A stretched timing chain can result in reduced power, so it was thrown straight into the bin. With enough space now cleared at the front of the engine bay, the stock cam can be manoeuvred out. The new Crane item slides straight into its void, with the supplied cam lube having been first smeared along its length. Note that the bottoms of the Crane lifters are also smothered in cam lube prior to their insertion. 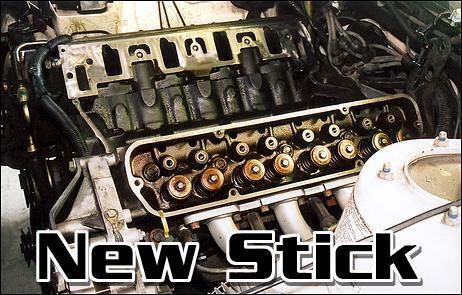 The Crane pushrods are a straight swap for the standard items. Replacing the original timing chain is a RollMaster double-row job, which is stronger than the factory part and multi-indexed to enable the cam to be dialled in. In this installation, however, cam timing was left at the standard setting. With everything thrown in, the engine is reassembled using the new gaskets. Now comes the extra fuelling bit. With the injector rails separated from the intake manifold, the bigger injectors can be plugged into place. These top-feed injectors really are a straight swap with absolutely no mods required - the standard pressure regulator and pump are retained. With the bigger cam and injectors now in place, it's possible to start and run the engine - but don't plan on driving it. Confused by the large amount of fuel passing through the new injectors and huge intake manifold pressure fluctuations (the VS V8 runs a MAP sensor), the un-modified ECU struggles to keep the engine running. Leon says fuel and timing is all over the place. Some extensive tuning is required at this point. With the car strapped onto Awesome's in-house Dyno Dynamics chassis dyno, Leon sets to work real-time programming the factory Memcal. Using the brilliant Kalmaker software, he is able to access and identify every data point in the Holden ECU - and there's enough to make most aftermarket EFI systems look like beginner's toys! So what exactly does Leon change? Well, this particular tune is tackled in separate parts. The first part is to compensate for the overwhelming fuel delivery of the big injectors and the different breathing characteristics of the new cam. With the new bump stick giving reduced low rpm cylinder filling, enhanced midrange and top-end filling, Leon alters the ECU's main volumetric efficiency tables to suit. This helps bring fuelling and ignition into line. The next job is to 'zoom in' on specific areas in the program. After fitting a larger cam, Leon aims to restore low-rpm torque by advancing ignition timing - but only to a point, because Daniel needed to be able to run everyday 91-octane ULP. Other specific areas that need mapping are accelerator enrichment, trans shift points and rev limit - Leon bumped Daniel's limiter up from 5500 rpm to 6400 rpm. With full access to all of the Holden maps, Leon also fiddles light load cruise conditions to maximise fuel economy. The factory lean cruise function, for example, is brought into action at less vacuum and after a shorter elapsed time than the standard vehicle - Leon changes the waiting time from 150 to 30 seconds. The actual air-fuel ratio during lean cruise is also usually set to 17.0:1, but Leon set Daniel's modified car to around 16.0:1 - just to be safe. And what about full load air-fuel ratios? Well, when it came in with just its exhaust and intake, Daniel's car was running between 12.0 and 13.0:1 all the way through the rev range under max load. After Leon's tune, it now holds 13.0:1 all the way - it's a small difference, but one that results in increased power without any reliability trade-off. Leon tells us going leaner made no difference, so it was better to "fatten it up" again to ensure durability. Let's get straight in - how much more power is achieved and how much does it cost? Daniel's VS 5-litre arrived at Awesome Automotive making 170hp at the wheels - as shown by the purple plot. After its cam change, lifters, pushrods, timing chain, injectors and computer remap, it now rolls out 201hp - as shown by the green plot. This 18 percent peak power increase is also backed by a very strong torque improvement - the dotted plots on the graph show gains of up to 32 percent in the mid-range (410 ft-lb, up from 310 ft-lb). Judging by the graph there is no torque lost at low rpm. Installation labour amounted to $780, the re-map cost $800, the timing chain set was $102, the lifters were $120, gaskets came to around $50, the camshaft cost around $280, and then you've got the usuals - $27 for coolant and $47 for an oil and filter change. As mentioned, Daniel sourced the ex-5.7 stroker injectors himself - he got a full set for $400, but later discovered two were shot. Awesome supplied two newies for a total of $140. All up, that 18 percent power gain cost Daniel nearly $2800 (including paying for those two faulty second-hand injectors). It's not quite as cost effective as the initial intake and exhaust mods, but its quite good value nonetheless. Summary - a Crane H286 cam, injector and remap package is an impressive upgrade for anyone that's got used to the power of their intake and exhaust equipped 165kW-spec Holden V8.